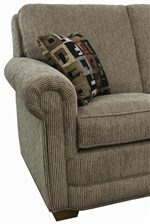 Create a transitional look in your living room, den, or elsewhere in your home with this upholstered arm chair. Plush cushions provide great support while you watch TV, work on a laptop, or socialize with guests. Rolled arms add a traditional element while tapered wood feet keep the overall look of this versatile enough to use in any decor. Customize the look of your chair with the choice of fabrics available by special order. The 80 Upholstered Chair with Rolled Arms and Tapered Wood Feet by Lancer at Wayside Furniture in the Akron, Cleveland, Canton, Medina, Youngstown, Ohio area. Product availability may vary. Contact us for the most current availability on this product. The 80 collection is a great option if you are looking for Casual furniture in the Akron, Cleveland, Canton, Medina, Youngstown, Ohio area. 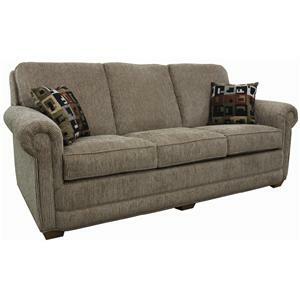 Browse other items in the 80 collection from Wayside Furniture in the Akron, Cleveland, Canton, Medina, Youngstown, Ohio area.